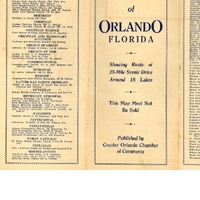 Street map of the City of Orlando, Florida, printed in 1936. The map shows the route of a 23-mile scenic drive around 18 lakes in Orlando. It has listings of apartment houses, churches, hotels, real estate brokers, newspapers, schools, clubs, newspapers and more. The map also lists 66 places on the scenic drive illustrated on the map. Original 17 x 22 inch map, 1936: Greater Orlando Chamber of Commerce, Orlando, Florida: Private Collection of Thomas Cook. Digital reproduction of original 17 x 22 inch map, 1936: Greater Orlando Chamber of Commerce, Orlando, Florida. Originally published by the Greater Orlando Chamber of Commerce. Copyright to this resource is held by the Greater Orlando Chamber of Commerce and is provided here by RICHES of Central Florida for educational purposes only. “Street Map of Orlando.” RICHES of Central Florida accessed April 23, 2019, https://richesmi.cah.ucf.edu/omeka/items/show/1022.